I just returned from a weekend in our nation’s capital where I caught the tail end of the National Cherry Blossom Festival at the Washington monument. Just down the Mall is the National American History Museum where I was able to finally view the Smithsonian pop-up exhibit, Paper Engineering: Fold, Pop, Pull and Turn. We learned about it on the blog here. The show is a wonderful exploration of different pop-up techniques with fine examples of movable books that dated back hundreds of years. There are also two short videos on a loop that provide some excellent background about making pop-ups. Over a dozen cases are well laid out and very approachable to the many visitors that streamed in while I was there. The addition of two button activated page turners made the movable books come to life and show some of the excellent movement that can be achieved through paper engineering. It was recently announced that there will be three upcoming lectures at the museum from some of the best pop-up artists in the world. 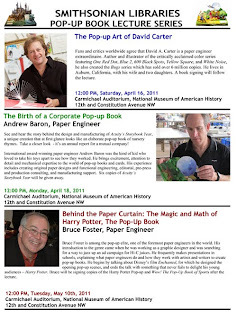 On Saturday, April 16th at noon, David A. Carter will talk about his pop-up artistry. Then on Monday, April 18th, Andrew Baron will discuss his latest project creating a pop-up annual report. Finally, on Tuesday, May 10th, Bruce Foster pulls back the curtain on his latest Harry Potter book. Be sure to check the PDF flyer for popupbookseries for more details on this exciting lecture series. Now I have to figure out a way to get back to Washington, D.C. this weekend.